Sanibel Island Cottages on Sanibel Island Florida Vacation Rentals at Periwinkle Cottages. named one of the top ten birding spots in the nation. 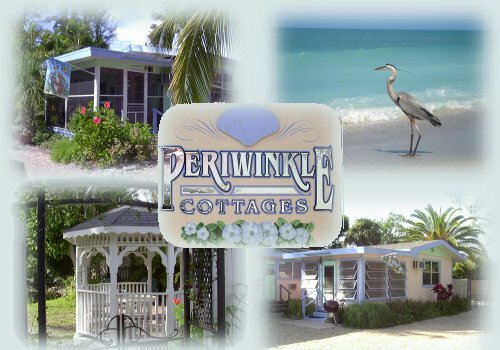 Periwinkle Cottages of Sanibel are nestled amongst the natural beauty of the exclusive, nature lover's west end of the island. Our vintage 1959 attached cottages have retained the Old Florida style and charm, while being comfortably furnished and tastefully updated for your enjoyment and convenience. Each of our cottages is designed for adults and children 13 years of age or older. Our property is completely non-smoking and pets are not allowed. We are your private, family owned and operated Florida vacation rental destination for relaxation; your home away from home without the interruptions. 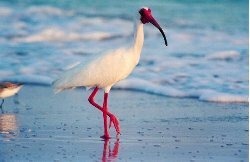 From our cozy Island Cottages, enjoy a short, pleasant walk or take one of our bicycles for a ride, just 300 yards to our private, pristine, wide and sandy white beach, the most naturally preserved on all of Sanibel! The Island's premium shoreline, on the gulf of Mexico, is reserved just for you and the few residents of our peaceful, small and friendly neighborhood. If you should choose to drive, unlike the more populated public beaches, there is no charge to park your car at our private beach access. Many of our valued repeat guests, from around the world, enjoy birding, photography, great swimming, gorgeous sunsets, watching for dolphin playing and turtles nesting. Of course, fabulous Sanibel Island shelling awaits you as well! Complimentary use of bicycles make it easy to get to Sanibel's world renowned nature attractions along "San-Cap" Road, including the Bailey-Matthews Shell Museum, C.R.O.W., the Conservation Foundation, Tarpon Bay Explorers, and, naturally, the J.N. "Ding" Darling National Wildlife Refuge, all within 3 miles. The Sanibel Recreation Complex, only 1.5 miles from your cottage door, offers a leisure pool, lap pool, tennis courts, a weight room and gymnasium. We invite you to take a photo tour for a sampling of what you will enjoy on and nearby our beautiful piece of paradise. Visit our local links page to check out additional activities, shopping, art galleries and a great variety of terrific restaurants our area offers. Our ideal location places you just close enough to businesses on both Sanibel and Captiva Islands, while allowing you to enjoy a more relaxed atmosphere. For more information please give us a call at (800) 247-0448 or complete the form on our Contact Us page. We will be happy to help! Thank you.